being exchanged.This common understanding is defined in Management Information Base (MIB) files. The complex, arduous task of creating MIB definition files can now be simplified by using the SimpleMIBEditorPro. SimpleMIBEditorPro is an easy to use, graphical tool that simplifies the process of creating SMI conforming MIB definition files, without requiring the user to be knowledgeable about the nitty-gritty details of ASN.1 syntax. 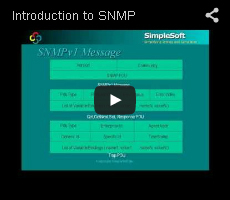 It guides the user in creating both SNMPv1 and SNMPv2 SMI documents by gathering information in easy to understand dialog boxes and automatically converting it into syntactically correct ASN.1 notation. SimpleMIBEditorPro creates new SNMPv1 and SNMPv2 MIBs, automatically corrects many common errors in existing MIB definition files, and also converts MIBs from one SMI to another. Once the MIB is defined, the work of building an SNMP agent that supports this MIB begins. Net-SNMP is a popular, public domain, SNMP stack that is widely used in the industry. For a Net-SNMP Agent to support the newly created MIB, the user has to first create stub interface functions that link the MIB variables to the underlying instrumentation. SimpleMIBEditorPro provides a graphical interface to the creation of these interface functions, and also invokes the associated IDE upon completion, thus facilitating rapid agent building. Unlike the "mib2c" command line utility, interface functions for the entire MIB tree can be created at once using the graphical interface. The code generation is done via a standard Tcl based interpretor and the Tcl source files are provided for easy modification and enhancements. User-defined code types and code generation functions can also be added if desired. Generate Net-SNMP specific stub interface functions, for the entire MIB tree. Associate interface function code types with variables. Supports both monolithic agent as well as sub-agent creation. Invoke the associated IDE like VC++ or Eclipse to complete the Agent building process. Add your own code generation functions using Tcl.